The Wild West: The first towns and cities are prospering and need new citizens who can help them develop. The players drive their coaches around the game board, building their road networks and settling their pioneers. Each pioneer has a particular profession, which grants benefits when they are deployed at the proper place. 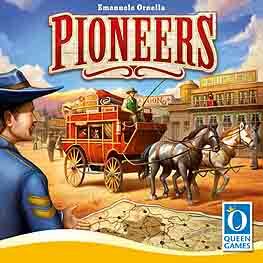 Pioneers is an exicitng game for the whole family, with lots of chances for players to skillfully explore new tactics in response to the ewver-changing conditions of the game.